Unveiled in 1947 at the Finland House in New York, the A1965 Pendant was an instant success for Paavo Tynell and one of the lighting fixtures considered to define his mid-century peak. 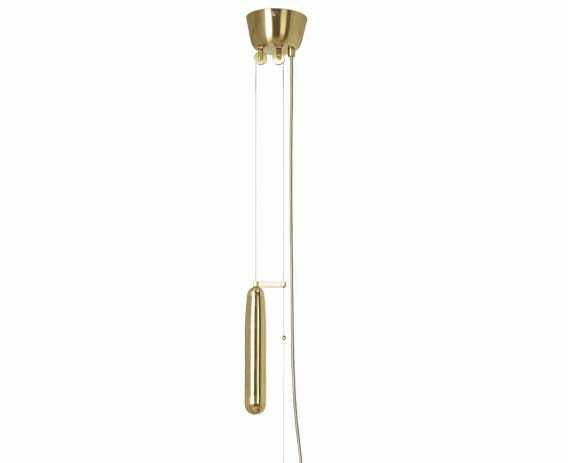 It delicately holds some of his most distinctive design traits; the perforated and polished brass material combined with a unique lift mechanism, raising and lowering the lamp to different heights. The A1965 Pendant gracefully diffuses the light downwards through frosted glass, omitting glare whilst gently illuminating the room. The hanging counterweighted A1965 Pendant was Tynell’s attempt to add lighting mobility to the ceiling fixture and combing the advantages of the portable and the installed lamp. The impeccable construction of the A1965 Pendant fully reveals Paavo Tynell’s knack for elevating ordinary light fixtures into functional art and this remarkable style played a significant role in shaping the aesthetic of mid-century lighting. Gracefully diffuses the light downwards through frosted glass, omitting glare whilst gently illuminating the room. Height can vary by pulling or pushing the lamp or counter weight. The pendants height can be easily adjusted with the counterweight. Installation required: Yes, this light needs to be wired up by an electrian.